You may have come across this defect in some of your recent shipments of nectarines. When most people see this defect they want to assume it is characteristic of the variety, or possibly from spray burn due to some kind of orchard spray. Although it is true this whitish discoloration occurs in the orchard, it is not caused by excessive spraying. The defect is called “Silvering” and it is actually caused by thrips feeding on the skins surface or epidermal cells. 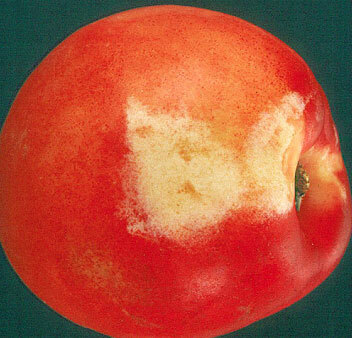 In the late season, this damage is characterized by the silvering of the nectarine skin, not affecting the flesh. So what are you allowed? For the US Fancy, US Extra No. 1, and US No. 1 Grades, you are allowed up to 10% of the surface with silvering. Using this picture as a guide, the silvering would exceed 10% of the nectarine’s surface. And since this is a quality defect, not more than 8% of the nectarines in your sample can have any quality defects, including silvering.